On Wednesday afternoon January 25 we gathered, eighty-strong, classmates, spouses, and significant others, at Charleston’s comfortable French Quarter Inn, from as far away as Seattle and Palo Alto, Peoria and Boston, Houston, Idaho, and Miami. A few blocks’ walk took us to our kickoff dinner at High Cotton restaurant. Next morning we split into two groups: one drove in vans to the banks of the Cooper River to view a remarkable survivor of the Civil War, the Confederate undersea vessel H.L. Hunley, first submarine to sink a surface ship, hand-powered by a doomed crew of eight, in Charleston harbor in February 1864. The Hunley was found and raised from the harbor floor in 2000 and is being painstakingly stabilized and preserved. We were treated to a rare look at the vessel outside of its customary submersion. The other group enjoyed a walking tour, commentated by expert local guides, of the picturesque old town of Charleston with its stunning streetscape of houses, gardens, churches, and harbor vistas. The two groups switched after a picnic lunch. That evening we split into three groups savoring three different restaurants: Anson, Magnolias, and McCrady’s. On Friday morning we drove across the Cooper River to Patriot’s Point, to visit the World War II-vintage aircraft-carrier-museum Yorktown and kamikaze-targeted destroyer Laffey; after lunch we took a cruise to Fort Sumter for an hour-long visit to that hallowed site where the Civil War began. That evening we all dined together at the elegant Circa 1886 restaurant. Saturday we boarded vans again and drove up the Ashley River Road to visit Middleton Place plantation, home to the country’s oldest landscaped garden and the country’s first camellias. Two of its three main residence buildings were burned by Union troops, but the spectacular gardens survived and were impressive with the mid-winter camellia bloom. 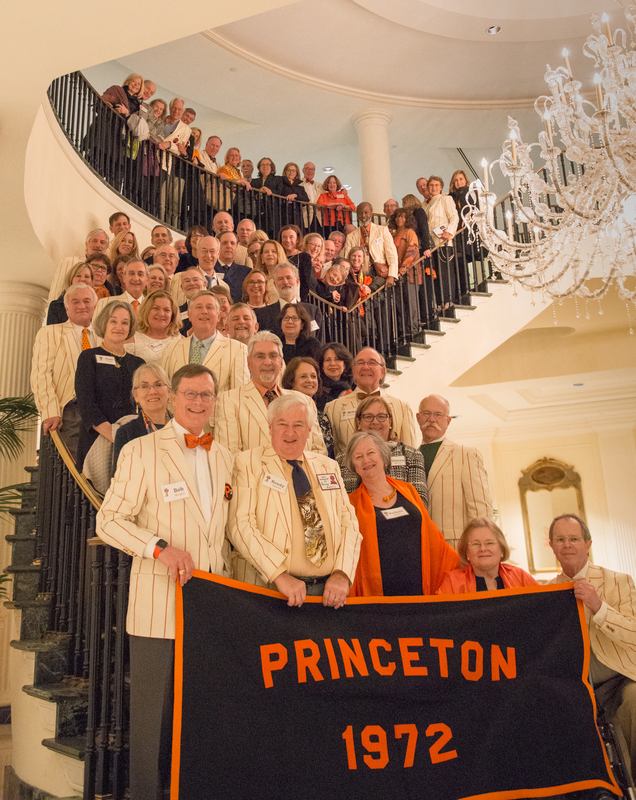 Our final, plenary dinner was at the Belmond Charleston Place Hotel, where we were again joined by local Princeton classmates and friends, and after which we paused to have our customary Class Trip photo on the hotel’s elegant winding stairway. Sunday we headed either home or on to other travel adventures. Once again we had all enjoyed insights into a place rich in history and culture, culinary adventures, and the most congenial company one could find anywhere.